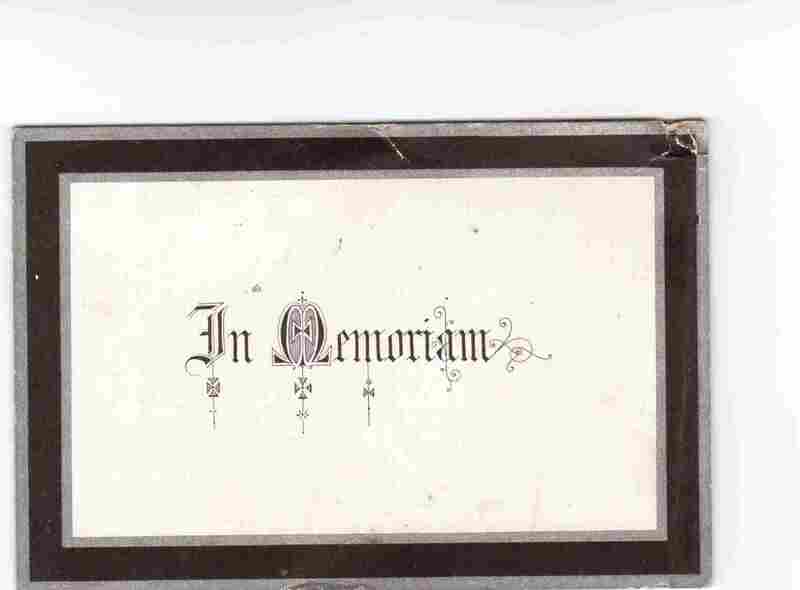 Right and below: An In Memoriam card for Jane Petherbridge, who died aged 82, October 17th 1901. When folded the card is 11½ x 7½ cm (4½ x 3 inches). The funeral was to be at Landscove on Tuesday, the 22nd inst., leaving Ashburton at 1pm. Jane was born Jane Coaker circa 1819 at Lydford. She married Richard Petherbridge in the September quarter of 1839. On the 1861 census (as Pethybridge on FreeCen) they are living at 'Bura' Ashburton - Jane is 42, and Richard, a farmer, is 44. He was born in Buckfastleigh. On the 1891 census (as Pethybridge on FreeCen) Jane is a widow and living in West St. 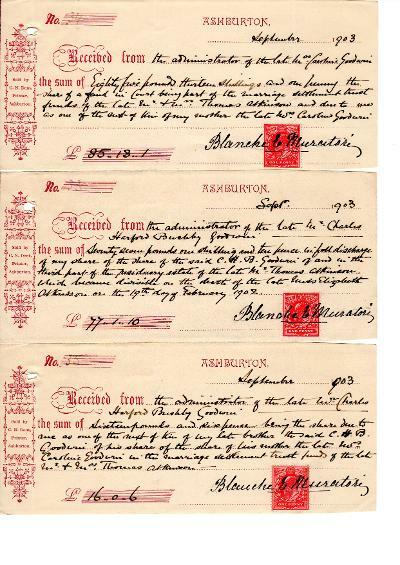 Right: Pre-printed receipts, sold by C N Dent, Printer, Ashburton. 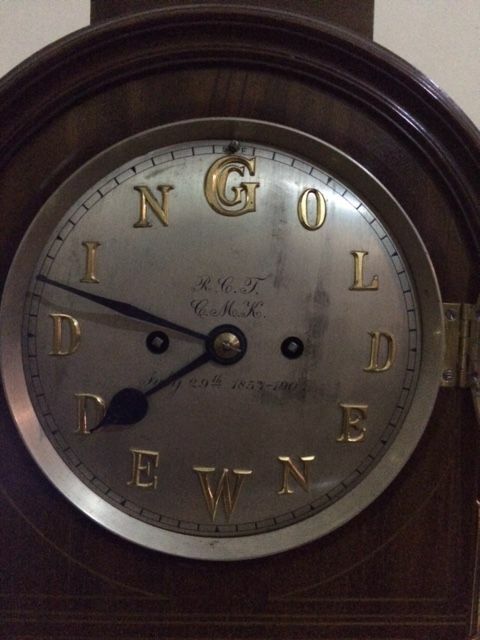 These have all been used in September, 1903, in connection with the estates of C H B Goodwin and Mrs Caroline Goodwin. Charles Napier Dent, a letterpress printer, stationer and bookseller, is at Caxton House, East Street for the 1911 census. His wife and daughter assist him in the business, whilst his 15 year old son is at school. For more on C N Dent see Booksellers, Bookbinders, Printers and Stationers under Banks and Businesses. Lot 27 (No. 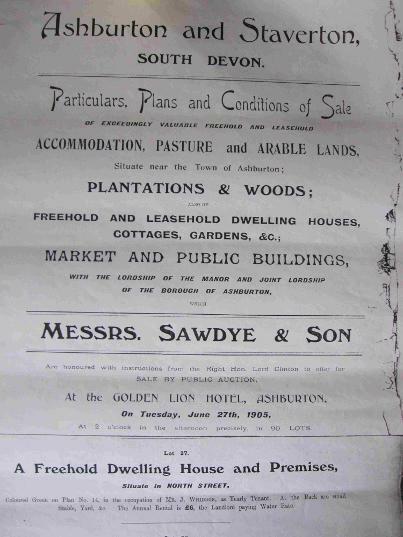 50) is in occupation of Mr J Whiddon, yearly tenant at an annual rent of £6. Lot 28 (Blacksmith's shop behind No. 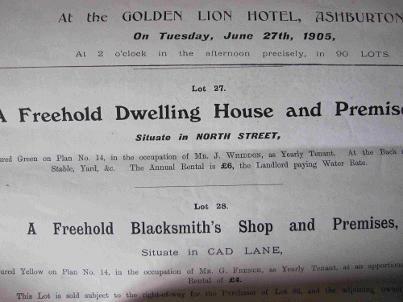 50) is in occupation of Mr G French as a yearly tenant at an annual rent of £4. Above and right: Why in 2013 No. 56 North Street is followed by No. 50. In 1950 a search of No. 50 was conducted on behalf of Mr William Martin. Mr Martin was of 44 North St and also of the Rising Sun, Woodland, publican. For more on blacksmiths, see the Banks and Businesses section, 1900s. 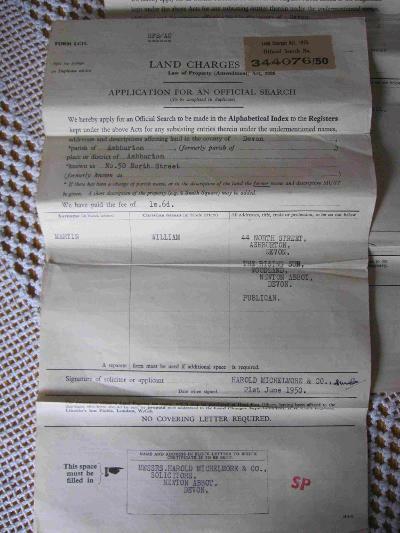 Many thanks to Jill Harrison for allowing me to view and photograph the documents above. 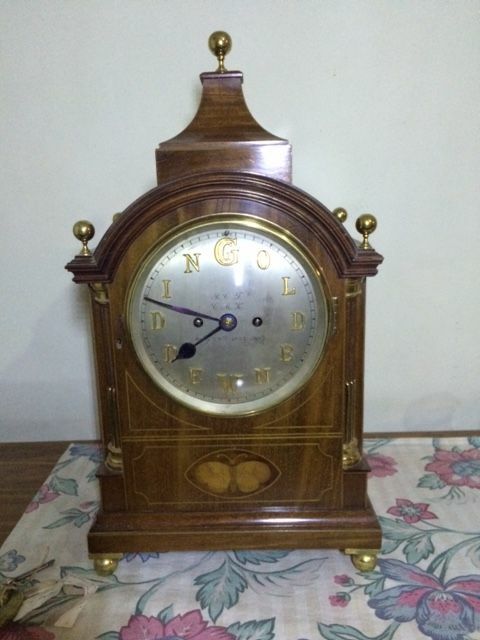 Left and below: A clock produced to celebrate the golden wedding of Robert Coard Tucker and Katherine Margaret Kitson in July 1907. For more on the Tucker family see Individual Families. 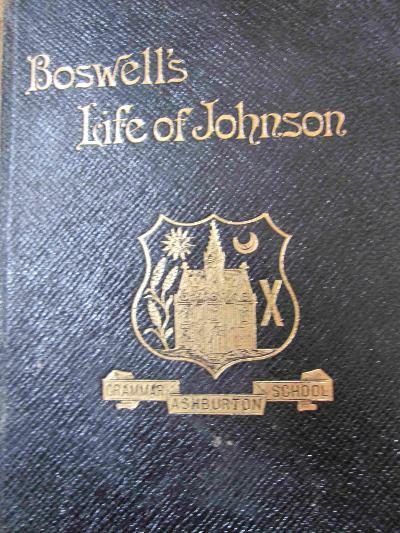 Right and below: 'Boswell's Life of Johnson' given as a prize at Ashburton Grammar School in 1908. The recipient was H Willcocks, then in From 4; the headmaster was James Mortimer. H Willcocks was possibly (but not certainly) Harold Willcocks, the son of Charles and Rebecca Willcocks. By the time of the 1911 census the family were living in Stone Park Terrace, and Harold, 15, is still at school. His elder sister Winifred Mary is a student teacher employed by Devon County Council. 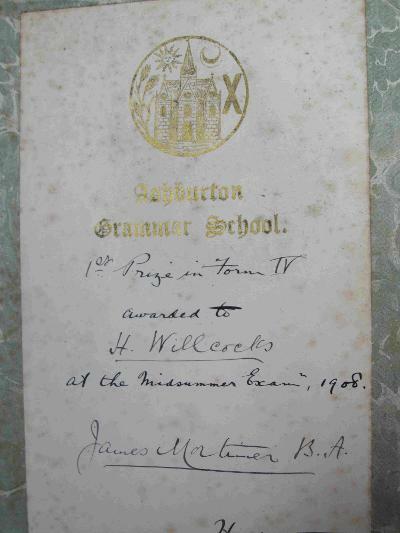 See the 1910s section of the Virtual Museum for another prize book from Ashburton Grammar School.